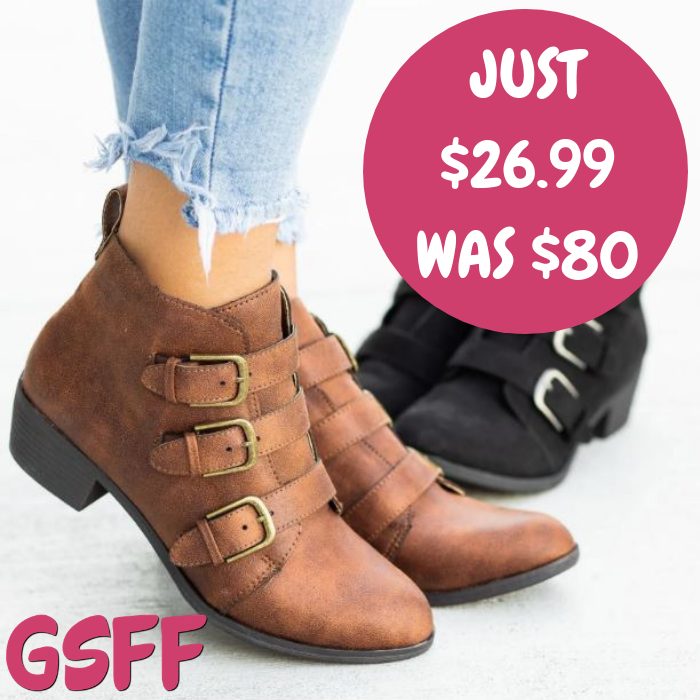 Triple Buckle Booties Just $26.99! Down From $80! Shipped! You are here: Home / Great Deals / Triple Buckle Booties Just $26.99! Down From $80! Shipped! TODAY ONLY! Hurry over to Jane where you can score this Triple Buckle Booties for just $26.99 down from $79.99 PLUS FREE shipping! These triple buckle booties just couldn’t get any cuter! They feature faux leather material, an almond toe, triple buckles, and approx. a 2″ stacked heel. Style them with a cute flowy skater dress and a cropped leather jacket to complete the chic and edgy look!